(CNN) -- Florida Gov. Jeb Bush on Thursday ordered the removal of the embattled Broward County elections supervisor from office, citing reports alleging neglect of duty, incompetence and misfeasance. The tenure of the official, Miriam Oliphant, has been marked by accusations of mishandling of the 2002 gubernatorial primary. Taking office shortly after the 2000 presidential election, Oliphant received heavy criticism for her role in the 2002 primary in which former U.S. Attorney General Janet Reno lost to attorney Bill McBride in the Democratic race. Some voters in Broward, which has more registered voters and Democrats than any other county in the state, received bad ballots and inaccurate registration information. Several polls opened late, and others closed early. Thousands of votes were not counted until a week after the election. Oliphant hasn't responded to repeated requests to comment on Bush's suspension order. A Democrat, she has been a frequent critic of the governor's administration. Bush appointed Brenda Snipes, a former Broward County school principal, to replace Oliphant. The governor has sought to distance himself from resentment borne out of the state's role in the disputed 2000 election in which his brother, George W. Bush, narrowly beat Al Gore for the presidency. Broward was at the center of that controversy. In a letter Thursday to state Senate President Jim King, Jeb Bush said he recognizes that the constitutional threshold for removing an elected official from office is "rightfully high," but he detailed a lengthy list of problems with Oliphant's job performance. "In this case, the proven, repeated and continuing failures of Miriam Oliphant to properly manage her office and take the most basic preparatory steps for the conduct of elections and the substantial likelihood for greater harm going forward make it clear that Ms. Oliphant can no longer serve as supervisor of elections for Broward County," the governor wrote. 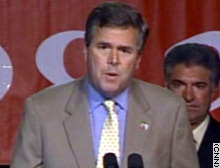 Bush based much of his letter on a report by Florida Secretary of State Glenda Hood, a Republican who oversees the state's election system. Hood's report, released October 24, found that Oliphant's office was poorly managed and unprepared to handle coming elections, calling it "a very disjointed organization fraught with low morale and constant uncertainty." Hood instructed Oliphant to correct problems -- including several recent firings and poor communication -- or face removal or suspension. "Once again Ms. Oliphant was given the opportunity to correct the serious problems in her office. Once again she offered denial, instead of service, to voters who placed their trust in her," Bush wrote to King. Hood dismissed allegations that criticism of Oliphant was motivated by anything other than her job performance. "This issue is not about partisanship," she wrote in a letter Wednesday to Bush. "It is not about gender or race. It is about the people of Florida, whose rights are expressly granted in our constitution, and of their unwillingness to condone certain conduct from their elected officials. We must never forget that public office is a public trust." Hood also responded to criticism that incompetence continues to mar Florida elections. "To my knowledge, until Supervisor Oliphant, no supervisor of elections has ever required such extraordinary assistance from local and state officials in the exercise of his or her duty," she wrote in the letter to Bush.